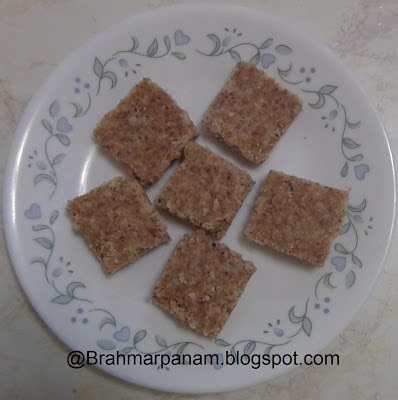 This is a very tasty and healthy burfi from Manjula's Kitchen. It is super easy to make and will be instantly liked by all. You can indulge into it without feeling guilty! Grease a small tray with ghee. Dry roast flex seed powder over medium heat for about 1 minute. Add walnut, almond and cashew powder. Dry roast for about another minute stirring continuously. Do not over roast the nuts or it may start to burn at the bottom.. Mix the cardamom powder and remove the mixture from fire and keep aside. In the same sauce pan boil the sugar and water together over medium heat. After syrup comes to boil lower the heat to medium and let it boil for 1-2 minutes till bubbles subside. Cool for a few minutes and cut them into small squares. Store in an air tight container once cooled completely.